Improper cleat alignment is a common source of discomfort, chronic knee pain, and injury. It is important to regularly check your cycling cleats for position and wear. Sometimes cleats inadvertently move, which can cause problems. Other times, riders let their cleats wear too far down before changing them, causing more issues. By regularly checking cleats, it is possible to identify adjustments to cleat position and possible sources of chronic pain or injury. Small adjustments can solve big problems. Left cleat has a more centered position than right. Right cleat is medial in attachment implying that the right foot sits wider on the pedal. Right cleat seems to be rotated in slightly, creating a slight heel-in bias of foot on pedal. Cleats and shoe are obviously impacted with dirt. It is suggested that cleats be mounted to the shoe with a greased screw. This will improve your chances of removing the screw at a later date, when you need to replace cleats. Shoe tread is worn. 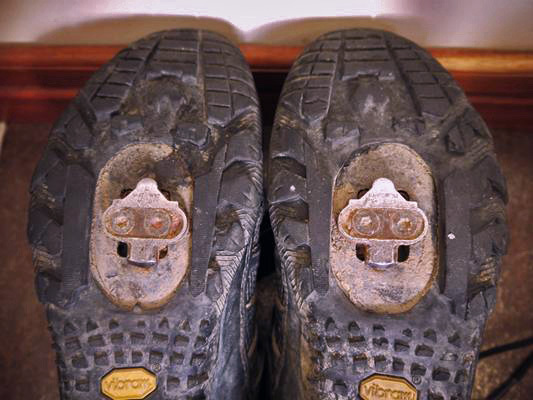 This will accelerate wear to the metal cleat when the bicyclist uses the shoe off the bike (walking, hiking, scrambling). What injury or pain syndrome might you expect this rider to develop? One could expect asymmetrical knee pain, either at the patella-femoral joint (knee cap), or laterally, representing the iliotibial band. If this sounds overly technical, well, it is, but that’s because it is an important aspect of keeping riders healthy and on their bikes. These are the elements a BikePT Pro has to consider when addressing cleat alignment issues, cleat setup, foot/pedal problems, and rider pain. It’s easy to overlook cleats as the source of a problem because cleats are often the most neglected part of a rider’s setup. They are out of site and out of mind until pain occurs, and even then the attention is often on the injury, not the cleat. Whether you are a rider or bike fit professional, checking cleats for wear and position is an important task.